In the twisting paths of human discovery, you never quite know what intellectual enterprise is going to result in a world changing discovery. For instance, the mathematical notion of expected value did not grow up in a sterile, academic environment. In 1654 Blaise Pascal was approached by Chevalier de Méré who was interested in gambling problems. Pascal corresponded with Fermat and thus the mathematical theory of probabilities was born. In recent days reports on economic upheaval have often cast financial industries as institutions based upon greed and power that contribute nothing of value to society. Defenders of the free market are quick to respond with the immediate economic benefits provided by such institutions as they mitigate risk and serve as “middle men” in modern financial markets. What is seldom considered is that discoveries in one area often find application in a separate area of life that was never considered during the initial investigation. And so one day, perhaps Wall Street calculations might be put to non-financial use that benefit mankind in other ways. There is historical precedent. For instance, interests in the insurance industry served to popularize and apply a 19th century Belgian calculation in a manner that is now used on modern exercise machines. Adolphe Quetelet (1796–1874) was a Belgian mathematician, astronomer and statistician. While studying astronomical activities in Paris he interacted with Joseph Fourier (1768–1830), Siméon Poisson (1781–1840) and Pierre Laplace (1749–1827). He went on to put his new found appreciation of probability to practical use in the study of the human body (a subject he had initially approached as a painter and sculptor). One calculation he created, dubbed the Quetelet Index, is a number that expresses a relationship between a person’s height and weight. Quetelet was not specifically interested in the use of his index for health purposes, but simply for defining the characteristics of “normal” or “average” man. In the mid 20th century actuaries observed increased mortality in overweight policyholders. And so in an effort to construct more accurate mortality tables the relationship between weight and cardiovascular disease became the subject of epidemiological studies. Weight tables were first used to predict life expectancy as far back as 1913. But tables of ideal or desirable weight were developed by the Metropolitan Life Insurance Company in the 1940’s. In the 1960s, a small group insurance industry experts began to use the Quetelet Index. But it remained for a an American scientist to perform a comparative study of available indices and rename the Quetelet Index to the form that we know it today where it has become a subject related to health and nutrition. Ancel Benjamin Keys was a scientist who wrote an article for the July 1972 “Journal of Chronic Diseases” that coined the phrase “body mass index” or BMI as a modern designation for the Quetelet Index. Interestingly enough, Keys early studies culminated in a B.A. in economics and political science in 1925. His first Ph.D. was in oceanography and biology but his later work was related to his second Ph.D. focused on physiology. He is best known for two dietary contributions – the K-Ration and the Mediterranean Diet. Keys (and others today) considered the tendency in the insurance industry to equate relative body weight with excess risk of death to be somewhat simplistic. There is worldwide variation according to diet and physical activity habits. In most industrial countries people in the middle range of body weight are healthier than those at an extreme. 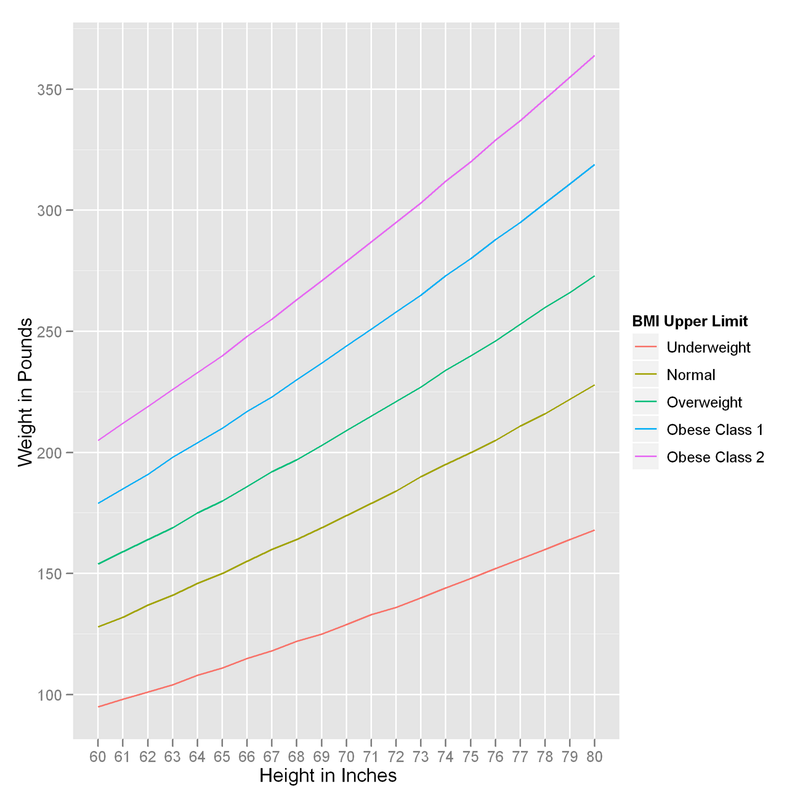 The actual BMI ranges considered healthy or at risk are still being debated. In 1998, the U.S. National Institutes of Health changed U.S. definition of normal from 27.8 to 25 to conform to World Health Organization Standards. In addition, other countries in the world are encouraging the upper limit for BMI to be even lower than 25. A grid, similar to one found here and the chart above can be constructed a script found at GitHub. There is some variation with the government site – perhaps related to rounding. To leave a comment for the author, please follow the link and comment on their blog: R-Chart.